If you want to create and maintain professional, stable and easily accessible blog or website, WordPress.com is a perfect free blogging platform for you. There you can in minutes set-up your website or blog, and immediately access its powerful tools for managing and updating your content. Customizing your site looks to the smallest details, sharing information, managing social connections and general maintenance was never this easy. Not only that you can access your site tools from your PC, but you can also carry all that power on your mobile phone or portable device. 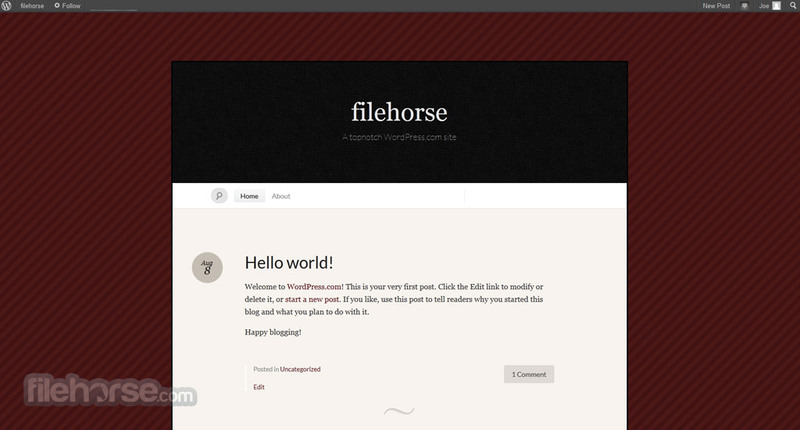 WordPress.com is a perfect solution for both novice users and veteran bloggers. However, professional users may be more inclined to visit WordPress.org where they can truly control absolutely every aspect of their site with our fully-featured Content Management System. The most popular blog publishing destination on the internet. As one of the most popular online websites in the world, WordPress managed not only to become the leading publisher of user-created blogs, but also one of the most popular web hosting services of the modern internet landscape. With industry leading cloud infrastructure that powers countless popular websites and dozens of millions of blogs, WordPressrepresents a service of choice of all people who want to express themselves on the internet. WordPress was created in 2003 by founders Matt Mullenweg and Mike Little, managing to evolve to the size when it’s now hosting more than 60 million sites, and servicing more than billion people each day. Even though if you don’t want to create your own blog, using WordPress you can follow blogs and sites maintained by countless professionals, groups and users that cover all areas of your interests. 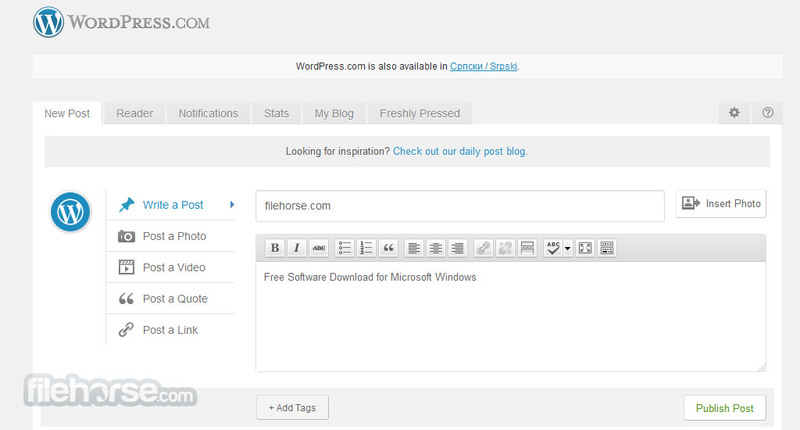 WordPress is not just online service where you can easily and in few minutes create basics of your free personal blog. It also has integrated tools for following other WordPress blogs, and with more than 60 million of them, you can easily find ones that are most popular and most relevant to your interest. If you do decide to make a new blog, WordPress is ready to offer you industry leading features and tools for easy content creation. From choosing themes, to customizing your UI placement, choosing your own background and UI image content, incorporating widgets, adds, and everything else, WordPress has it all, and it offers it to you inside of the interface that is easily manageable even by computing novices. With total control of content creation and blog interface, also come more advanced options that are available to every WordPress user – plugins that can enhance functionality of your site, support for multi-user editing and management of content and chat, native support for content management from all modern portable operating systems and devices (iOS, Android, WebOS, Blackberry and Windows Phone), Search engine optimization, clean permalink structure, tagging of articles, automatic placement of articles in multiple categories, automatic formatting filters, and much more. Interface of WordPress is modern and clean, with clear feature structure that you can get accustomed to in minutes. To enable easier use by novices, users have ability to choose complexity of their content editor with set of basic and advanced text and image options that can be used. By managing to place really large amount of tools and features inside of its content management page, Wordpress cannot be considered the most simple blog editor, but that ability to take full control of you content is something that we think you really need to have access to. 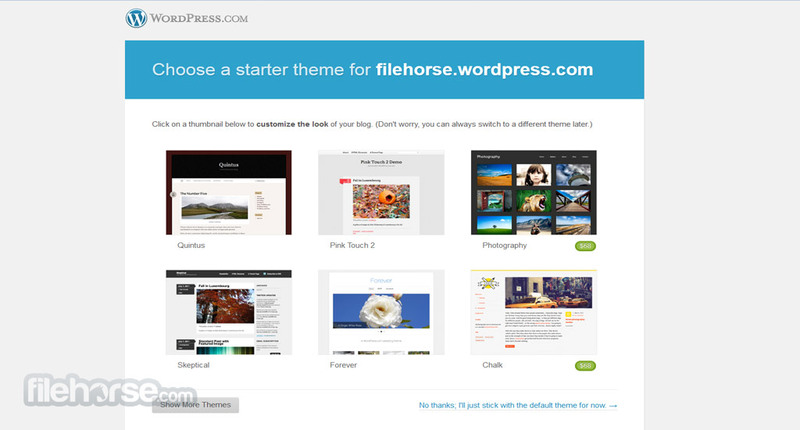 Wordpressdoes not offers great features only to content creators. Visitors also have ability to follow blogs, bookmark most interesting articles, manage bookmarks in their own categories, share everything their find with their friends, and engage into conversation directly on the article pages. WordPress features 100% free registration and blog hosting, requiring from you to provide valid username and blog address. Hosting under the WordPress.com subdomain is free, but it you want your own custom domain, you can instantly get one for $25 per year. Paying for $99 yearly subscription with also give you access to more storage space, removal of ads, more custom designs and better support for video content. WordPress currently hosts 26.4% of the top 10 million websites in the world, making it the most successful and widely used publishing platform that you can access to for absolutely free. With incredible mix of features, design and accessibility, WordPress definitely deserves your attention. WordPress is a amazing free blogging platform for you!